Historically, CRMs have been seen as a tool for Admissions, but today’s CRMs are capable of so much more. 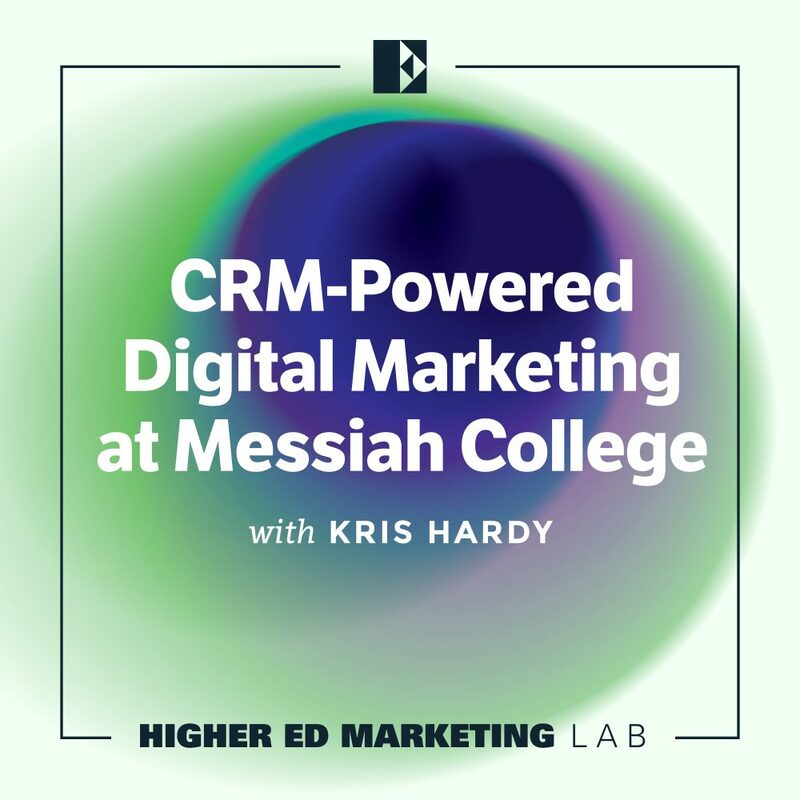 In this episode, Kris Hardy, Director of Web and Digital Marketing at Messiah College, stops by to share how the school’s CRM has transformed their digital marketing efforts. Smart tactics they’ve implemented on their website around personalization and how they gather leads. Jarrett Smith: Welcome to the Higher Ed Marketing Lab. I’m your host, Jarrett Smith. Each episode, it’s my job to engage with the brightest minds in higher ed in the broader world of marketing to bring you actionable insights you can use to level up your school’s marketing and enrollment efforts. In this episode, we’re talking with Kris Hardy, the director of web and digital marketing at Messiah College. Kris is a really sharp digital marketer, and we spend most of our time talking about how Messiah has effectively used their CRM to empower their marketing team. We talk about how the CRM has changed the way the marketing team interacts with other departments, specific challenges they encountered as they began rolling out larger volumes of personalized, automated communication, and towards the end, Kris shares some really smart tactics they’ve implemented on their website around personalization and how they gather leads. Without further ado, here’s my conversation with Kris Hardy. Jarrett Smith: Kris, welcome to the show. Kris Hardy: Yeah. Thanks for having me. Jarrett Smith: Yeah. To kick things off, could you just give us a little bit of background on Messiah College and your role there? Kris Hardy: Sure. Messiah College is located in Central Pennsylvania. We’re about 10 miles south of the state capital of Harrisburg. We have around 3400 students on campus, and around 600 of those students are part of our graduate program. It’s definitely a growing campus. I really enjoy my job and love being a part of everything at Messiah College. Kris Hardy: I am the director of web and digital marketing, so I oversee the public facing website, Messiah.edu. Also recently, I took over the strategy for our digital marketing efforts for our graduate and undergraduate programs. We do a considerable amount of work there and spend a good bit of money there as well, so I oversee the strategy there. More recently, within really the last year, I’ve begun to play more of a role with our CRM platform. We’ve migrated into Slate CRM about two years ago. As our graduate programs and undergrad programs have begun moving into that platform, I’ve begun to play more of a role in just how we do our com flow and how the CRM is integrated with our digital marketing initiatives. Jarrett Smith: Awesome. I would really love to dig into how the CRM has really specifically empowered your digital marketing team and all those efforts you’re doing there, but I know you said it was two years ago that you rolled out the CRM, so I imagine the pre-CRM world is still fairly fresh in your mind. Could you set the stage for us, talking from a digital marketing perspective perhaps or maybe a broader perspective? What was that pre-CRM world like? What were the main friction points that you knew about and dealt with frequently? Kris Hardy: I think one of the biggest things moving to a CRM really did for us was help us consolidate everything into one place. When I think about pre-CRM, I just think about all those different pieces of technology and systems that we were using. We had a lot of our RFI and visit forms within our CMS platform that we used for our public facing website. We had Constant Contact emails. We had other emails just going out through Outlook with no merge. We had an in-house application system. We just had a lot of different data in a lot of different places. Kris Hardy: It was really hard for us to manage all that, but I think another big piece of the puzzle too was just thinking through the user experience as well. If someone did fill out a request for information, for example, their information really didn’t make it into our student information system until that was manually exported. Maybe that took a week or a few days. Then we then had to export that back out into Constant Contact to send out a welcome email from the admissions counselor. While it wasn’t efficient for us, it was also creating a lot of bottlenecks and problems with our prospective students. Jarrett Smith: I can’t believe you didn’t want to keep going with that. I know you and I’ve gone back and forth a little bit about how it’s kind of unusual that in your role as a digital marketer for Messiah that you have the level of access that you do to the CRM and there’s a lot of buy-in about how the CRM can really empower the marketing activities you’re doing. I’m kind of curious. At Messiah, what made that possible at Messiah? What are the conditions in place that really allowed your team to have the kind of access that it does? Kris Hardy: I think early on, when we began the CRM search process, then enrollment team, sharp group of folks, really understood that the CRM has been evolving a lot. Five years ago, it was a tool really just for sales or for admissions, but now we see web analytic tools built into CRM platforms. We see marketing automation with our com flow. I think that was a really … It was good for them to acknowledge that and invite myself and my marketing colleagues to the table, and that kind of played that liaison role. We were involved. When I say we, the marketing office at Messiah. We’re involved in that CRM selection process early on, so we were able to speak into some of the different features and ask questions early on. Jarrett Smith: Mm-hmm (affirmative). One of the things that always kind of fascinates me is that early on when we’re thinking about rolling out some big piece of technology, there’s a lot of questions around features and how is this going to work and what fields are going to map to what and how are the integrations going to go, but sometimes I think it can be easy to overlook the organizational impact, the more sort of dynamic that can happen on teams or between departments, and how the technology can subtly shift that. Now that you’re a couple of years into your CRM world, have you find that the dynamic either on your team or between departments has changed in any way? Kris Hardy: Yeah. I think that’s a really interesting question. If you look at the different types of communication we have with prospective students, specifically like print versus digital, at my institution, we figured print out a long time ago, how to collaborate. Obviously, the admissions team needs graphic designers, need the marketing team to role out those publications. On the digital side, that was still kind of … We were still trying to figure that out. There really wasn’t a clear connection point. The CRM played that bridging role, where, “Hey, we have this new platform. We know that we have the ability to automate and communicate with prospective students, but now we need your help creating these email templates, writing copy, and thinking strategically about how we do this.” It really helped us mimic what we’d been doing on the print side on the digital side as well. Jarrett Smith: Mm-hmm (affirmative). I’d be curious, just if you can think back, how much of that did you really anticipate, you guys could see that shift coming, versus, “Hey, surprise! Our mindset needs to change. We didn’t really anticipate this, but cool, pleasant surprise”? Kris Hardy: I think there was a fair amount of anticipation, just with the product demos and everyone on that strategic team knowing we wanted to do some pretty serious marketing automation with our digital pieces, text messaging, digital marketing. I think what surprised us was just all the tools that the CRM equipped us with that allowed us to do that. We keep going deeper and deeper with that. We started with just automating the com flow for inquiries. Now we’re down into, “What about admitted students? What about students who’ve started their application but haven’t actually submitted it?”, and getting into some of those really specific audience segments within our prospect pool. Jarrett Smith: Yeah. That was kind of one question I had. Obviously, when you roll out a really big piece of technology like this, all of a sudden you have some capabilities that you didn’t have before. I was curious about your thought process as you all thought about, “What do we prioritize first? Got a long wishlist. What needs to bubble to the top of that list?” How did that conversation go, and what was y’all’s thinking around that? Kris Hardy: Yeah. I think if you look at the prospective student funnel, obviously it starts with your prospects or purchase names, inquiries, applicants, admits. I think we really wanted to start higher up on the funnel just because that was much easier, as far as the admissions counselors aren’t communicating a lot with inquiries, there’s not a lot of back and forth happening there. I think one of the biggest things we’ve realized as we’ve automated communication is that that really increases the possibility of creating conflicts. If an admissions counselor is chatting with an admitted student about, “Hey, I need you to fill out your FASFA”, and then they say, “We’ll fill it out next week.” Then they get an automated email that’s ghosted from that very admissions counselor saying, “Hey, click this tonight.” It can get confusing and frustrating. I think starting at the top of the funnel where we could really push out a lot of information without having to worry about those conflicts made a lot of sense for us. Jarrett Smith: That’s a really interesting point you bring up. I did want to ask how … You’re taking this top down approach from the funnel. Were there any other strategies that you felt were really helpful in kind of de-conflicting? Once you had this enormously complex machine running, was there anything else you guys did to head that off or remediate as quickly as possible when it’s happening? Kris Hardy: We’ve always tried to be very personalized in our communication, but what we’ve found is, again, when we get down deeper in the funnel, having an email that’s automated but ghosted from a specific admissions counselor … Like I said, we do have those conflicts. To mediate that, we’re doing more generic messages for admitted students. It might be from the office of undergrad admissions. It might be more value proposition, just keeping us top of mind. Then we’re relying more on the admissions team to be sending off those one on one emails. That’s still something that we’re trying to figure out. We’re only a year in on the undergrad side of the house, so those conversations are evolving and we’re learning something new every day really. Jarrett Smith: Yeah. Good stuff. I saw you present a high ed web on this. Did a great, great presentation. I’m really curious, how did the CRM change the way you evaluate your day to day marketing activities? Because I know it brought a level of visibility that you had not had before into maybe what’s working, how much something is really costing. Can you talk about that a little bit? Kris Hardy: Yeah. I think as far as digital marketing goes, and specifically on the undergrad side of the house, early on, five years ago or so, when I thought of digital marketing, my mind immediately went to lead generation, but I think what we’re learning, especially with the tools and the CRM and us having the ability to pull out specific populations or groups of students, is that the CRM and digital marketing do an amazing job cultivating and nurturing leads that are already in our enrollment funnel. Kris Hardy: If you think about it, sophomores and juniors, I think … I looked earlier this week. We have almost 10,000 sophomores already have inquired to our institution, so there’s a lot of them out there, but that’s a really long lifecycle. A sophomore this time of year, they’re going to be in the enrollment funnel for over two years. Having the ability to not only email them, but to target them on Facebook, Instagram, and Snapchat, really brings a lot of value to the table. Kris Hardy: For those that don’t know, the audience builder within Facebook and Instagram and Snapchat basically allows us to upload inquiries or anybody in our funnel and those systems or platforms match users that they have. Typically, we see between a 60% and 70% match rate for the people we have in our system versus the users on those platforms. We’re able to send out very targeted and specific messages to a prospective student, depending on whether they’re an inquiry or someone who may have already been admitted, to really kind of keep nudging them along and keeping us top of mind. That type of digital marketing, the retargeting or the targeting, is pretty cheap and inexpensive. It’s not like we need thousands of dollars a month to do that. It’s pretty affordable, and it’s been very effective for us. Jarrett Smith: Thinking along those lines of personalization, I know you guys have also done some advanced things with Google Tag Manager. Jarrett Smith: Which I think is intriguing because I feel like Tag Manager is not the most intuitive piece of software to use, but there’s a lot there that you can tap into. I would love if you’re going to talk about some of that further personalization you’ve done on the website. I don’t know. We’ll see if it’s possible to explain this without good visuals. Kris Hardy: Another thing we do is, with our digital marketing, we add a value in the query string. Basically, Google Tag Manager is just listening for that value. Any time a URL has that value in the query string, it fires another script that basically adds four different links to the bottom of the user’s screen, visit, apply, chat, and request for information. Then also after 60 seconds of being on the site, a light box pops up and really tries to nudge them. That’s something that we felt uncomfortable pushing that to every user just because we have so many current students, faculty, and staff, but we know people clicking on our digital ads are in that college search mindset. It made sense for us to push that a little bit more. We’re able to use Google Tag Manager as a way to do some of that without spending a lot of money on a personalization engine. Kris Hardy: Yeah. I think it was actually 30%, or I think it was more like 34%, of the people who requested information or converted as a result of the ad did so because of the sticky bar at the bottom of the screen or the light box. Kris Hardy: People are definitely interacting with it, and it’s just a good reminder I think. We’re kind of in this day and age where information is so readily available on your website, a prospective student kind of … Some of the utility is lost in requesting information. It used to be where they had to request information to get more information. Nowadays, all the information needed is on the website. It is good just to keep poking them and try to get their information so that we can start communicating with them. Jarrett Smith: Yeah. I know you guys also did some interesting stuff with your RFI form. Kris Hardy: Yeah. We created some branches in there just because we wanted the RFI form to be the least intimidating as possible. You go to some schools’ websites and the RFI form feels more like an application form, where they’re asking all these crazy questions, parents’ names and email addresses, but we really wanted to make it as simple as possible. I mentioned earlier that we are spending a lot of money on Google Search and Google Display and Facebook, Instagram. We want to see the return on investment for that, so one of the big reasons we decided to really simplify the RFI is just to make it easy for those people that are coming from those mediums. Kris Hardy: If you think of somebody who’s done a Google search for “private college in Pennsylvania” or whatever, if they clicked on your ad, they’ve likely clicked on other people’s ads as well. They’re probably just going from school to school, so we want to make it the least amount of work as possible just to get their information. What we do is we have the fields that we consider necessary to effectively communicate with that prospective student. That’s really just first name, last name, email address, their start term, and their high school. With that, we can figure out what com flow, are they a sophomore, junior, senior. We know because of the high school who their admissions counselor is. We have their email address. Kris Hardy: We can communicate effectively, but we also have a question at the very bottom, “Do you want to add more information?”, basically. That branches the form where you get a lot more fields. If they are interested in providing more information, they can do that there. That gives the admissions team a little bit more to dive into and sink their teeth into in evaluating these prospective students. Jarrett Smith: Mm-hmm (affirmative). Do people actually opt into that? Do they engage with that and volunteer more information very often, or how does that break down? Kris Hardy: I was actually surprised that they do. The majority of people do click on the more information and add at least their address. The way that we address that, we didn’t just say, “Hey, do you want to provide more information?” We said, “In an effort to provide you with higher quality print communication, or whatever, click here and add your address.” We’re giving them a carrot at the end of the stick. “This is why you should provide more information.” I think that our main goal there is when they land on that initial RFI page, they’re not overwhelmed and they don’t have to scroll the screen. They can see that submit button right there. Jarrett Smith: Yeah. Just a really, really smart approach. We’re heading into 2019. Kris, what’s on your wishlist now? Where are you guys headed? What are you trying to tackle that’s a high priority for you now? Kris Hardy: Yeah. I think some of the things that we’re looking at doing is connecting our CRM data with some of our ad platforms. I mentioned earlier that we’re using Slate CRM, so last year they rolled out basically an API connection between Slate and Facebook and Instagram, which is great. Any time we have a prospective student fill out that RFI, within three to six hours, they’re receiving a Facebook ad specific to them being an inquiry and specific to their start term. We don’t have that ability in Google and Snapchat, even though they do have some APIs, so we’re probably going to custom build some of that so that we can pass some of this information back and forth. That’s I guess more on the digital marketing side. Kris Hardy: I think we’re always also trying to improve our digital communication flow, just with our emails. There’s so much that we’re learning from the analytics, what’s working, what’s not. Just looking at simple things like open rates and click rates, taking what we’ve learned there and producing more emails and maybe even pulling back some. We’re also learning a lot about the time of year and the specific types of emails that go out. While on one side of the house we’re very focused on automation, but we also need to think about some of those batch emails that we’re sending out, when the FASFA deadline’s coming up, our different deadlines. Just making sure we’re thinking about all that strategically. Jarrett Smith: Mm-hmm (affirmative). Very good. Kris, this has been a really great conversation. Thank you so much for sharing your knowledge and the really cool things you’re doing at Messiah. If folks want to connect with you, find out more, say hi online, what are the best places to do that? Kris Hardy: Sure. I think Twitter’s probably the best. My Twitter handle is krishardy83, and it’s Kris with a K. That’s a great place. Jarrett Smith: Excellent. Thank you. Kris Hardy: Yeah. Thank you. Jarrett Smith: The Higher Ed Marketing Lab is produced by Echo Delta, a full service marketing firm dedicated to helping higher education institutions drive enrollment, increase yield, and capture donors’ attention. For more information, visit echodelta.co. Jarrett Smith: If you enjoyed this episode, please subscribe and leave us a review on iTunes. As always, if you have questions, suggestions, episode ideas, or just want to reach out and say hi, drop us a line at podcast@echodelta.co. See you next time.